Ipswich Borough Council are currently consulting on what should go into the Supplementary Planning Document (SPD). It is primarily about planning applications, and roads or footpaths as part of new housing schemes such as the Northern Fringe/Ipswich Garden Suburb. 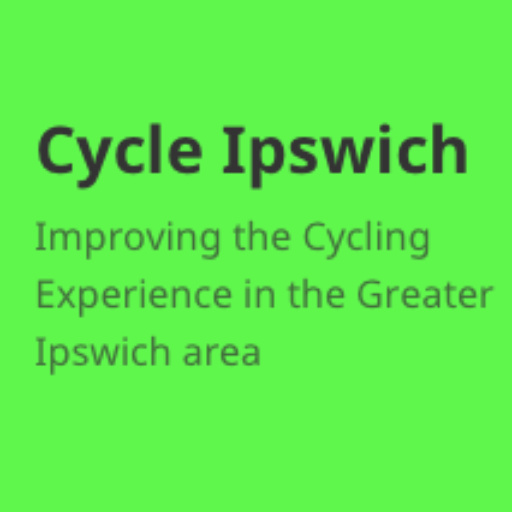 This blog post is a collection of the main items we (Cycle Ipswich) would like to see included within the SPD. There are 2 handbooks which were released around April 2014, which contain very good direction that should be referenced and used as inspiration. 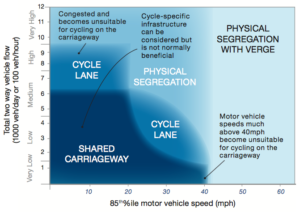 First is the “Making Space for Cycling” document published by Cyclenation, and written by Cambridge Cycling Campaign. This document is better, it gives a higher level view, which is better for policy makers. Second is the more detailed “Sustrans Handbook for cycle-friendly design”, which includes many dimensions and specifics, being more aimed at engineers. Of particular note is the diagram on page 6 highlighting which type of infrastructure to use depending on the speed and volume of traffic. It is worth noting that there are several items which are not good practice in the Sustrans document, which David Hembrow clearly describes. These are particularly where the design of the infrastructure puts cyclists and motor vehicle drivers into conflict. Low level traffic lights for cyclists which are at eye level rather than high up. Red cycle symbol on cycle signals, which would make cycle specific signals clearer. “Except cycles” plates can be added to existing restrictions without a Traffic Order. Zig-zags can be offset up to 2m from the kerb so that cyclists don’t need to ride over them and cycle lanes can continue through the junction. Cycle Streets where cars are guests. Flexible traffic wands or armadillos to separate cyclists from traffic. Cambridge Cycling Campaign have an excellent cycle parking guide, as do Cambridge City Council. Particular note should be given to the design of the stands, including the spacing, positioning, and access dimensions. Swept paths are also included to highlight the ideal widths and layouts required. Cycle parking should be signposted so that you can find it in a similar way that you get directions to car parks. Car parks that include cycle parking should also note that cycle parking is available in the signage and publicity. Where you cannot park a cycle, there should be a more obvious sign highlighting where you can park in a positive manner and minimising the negative you cannot park here. Conflict between cyclists, pedestrians and motor vehicles should be avoided at all times. 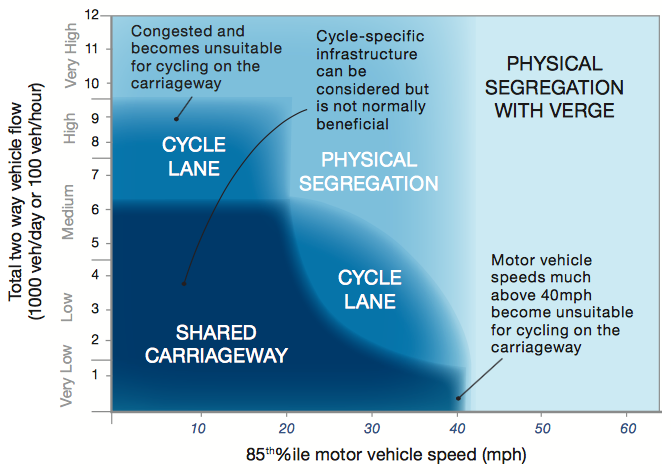 The current significant use of legalised pavement cycling in Ipswich does not encourage large amounts of cycling. In some places there are 2 types of infrastructure, one for confident cyclists on the road, and another on the pavement for less confident cyclists. This should be changed so that there is one bit of infrastructure which ALL cyclists are happy to use. This will often mean that mobility scooters and similar vehicle users will use the cycle infrastructure too as it’s so good, and reduces conflict with other vehicle types. Many of the key main routes into Ipswich don’t provide a lot of space for protected cycle infrastructure, so as an alternative some corridors should become key cycle routes with no through motor traffic, and only access to properties, whilst other corridors would be primarily for motor traffic. There would then be quiet links between the corridors too to encourage people to cycle round to those cycle route corridors. Cyclists dismount signs should only be used in extreme circumstances. It is really rare that there is a valid use for them, or the cycle infrastructure is not good enough. Please respond to the consultation by Monday 17th August 2015 at 11:45pm. Until such time as we get a national regulation of taxi operators and drivers, the Council to provide for cycle carriage as a facilty on all ‘accessible’ taxis. This has been found to be a much desired ‘insurance’ for the less confident cyclists, and those not happy with riding back late at night on certain roads. Where the Council(s) subsidise local bus services, to take on the default position of Western Isles Council, and put cycle carriage as a requirement on bus services – especially those going out to rural destinations late at night, on unlit and fast roads. Until changes sought by PACTS report are delivered to deliver a more open access to crash investigation, and the remedial measures the Council(s) are mandated to deliver (Section 39 RTA 1988). A clear policy on the hierarchy of safety management – first objective, eliminate hazard, then provide positive risk management (ie level crossing barriers/bollards) then soft management (traffic signals) then consensual management (give way & indicated priority).